*A version of this review was originally posted at Movie Mezzanine. Putting aside Prince of Persia, in which Jake Gyllenhaal, one of America’s whitest actors, played Persian royalty, Hollywood has rarely ever shown us a Middle Eastern man who is not an imminent threat. When it does, there is so much self-conscious winking involved that the audience is constantly made aware of the filmmakers’ efforts to create believable Middle Eastern characters who are normal people. Still, that modicum of character development causes much shock and chagrin to the American Right Wing – recall the hyperbolic, panic-stricken reaction to the Taqiyah-wearing medical doctor in Non-Stop. 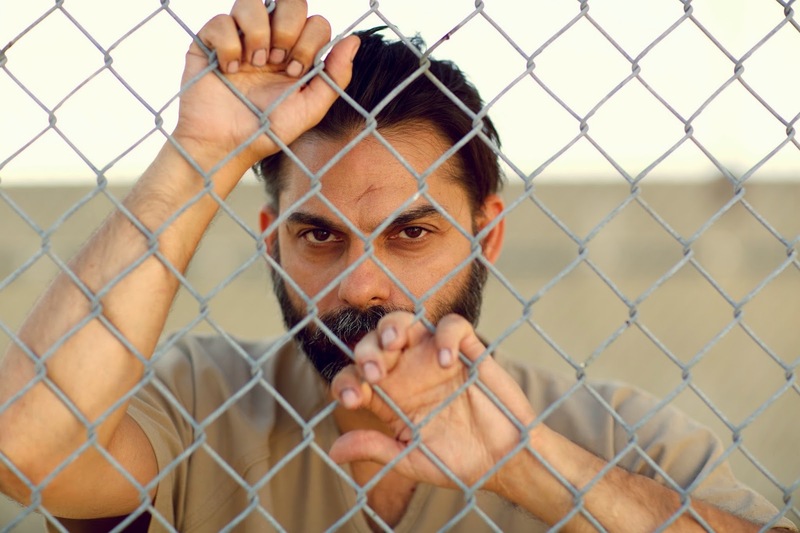 Within that context, Peter Sattler’s first feature film, Camp X-Ray, is such a breath of fresh air that one—at least, this one, Iranian viewer—can almost forgive its abundance of flaws. The film opens with a stellar sequence in which Ali (Peiman Moaadi) is kidnapped as he prays in the privacy of his home, beaten ruthlessly, and taken away with a black bag over his head to Camp Delta in Guantanamo Bay. He is taken to a solitary cell in a block that houses other suspects of terrorism who have been arrested without trial. A few years into his detention, the annual rotation of guards brings him the inexperienced but tough presence of Amy Cole (Kristen Stewart). Amy is drawn to the educated, artistically inclined prisoner—officially called a detainee for reasons of political shadiness on the US government’s behalf—but the obvious limitations of their relationship leaves it as tenuously as budding attraction can be. Before too much credit is given to the film as some sort of ideal of representation, it needs to be underlined that Camp X-Ray isn’t entirely free of Hollywood’s problematic relationship with the Middle East. Complications remain. The necessity for the lead character to be a prisoner so his story can be told is irksome, though we can’t blame Sattler for choosing to tell this story and not a romantic comedy starring Moaadi instead. What Sattler can be blamed for is the stark difference his screenplay creates between Ali and the largely silent but evidently violent company of detainees he enjoys in the camp. Though Sattler’s heart is in the right place, the feeling that the film is making an extra effort to convince the audience of the humanity of its subject is inescapable. Perhaps it is the unaccustomed audience that needs convincing, but the presumption on the film’s part is nevertheless obvious. Worse yet, the classic signifiers that treat Middle Eastern people of diverse ethnic and linguistic backgrounds as a monolith are regrettably on show. At one point, an Arab prisoner inexplicably speaks fluent Persian, for example, when he’s meant to be speaking Arabic; a lazy, “surely no one will notice” attitude that has lamentably become a staple since Michael Mann deployed it in the otherwise precise The Insider. The relationship between Ali and Cole develops gradually over the course of a year. Ali begins this period by throwing a cup of his faeces on her in an act of revolt and ends by sharing one of the most intimate moments of his life with her through the barrier of a small glass window in his cell’s door. In between, there are several conversations about Harry Potter, the seventh book of which Ali desperately wants but cannot find in the camp library. Most of their interactions are written and directed with a heavy touch, with one particular conversation about a caged lion Amy once saw in a zoo especially worthy of an eye roll. Yet, Moaadi and Stewart paint such stellar portraits with the limited palette they are offered that they elevate the film well above its text. Moaadi, in particular, who is getting a rare chance for an Iranian actor to shine in a prominent role in an American film, brings a level of grace and humor to the role that frees it from its spatial and thematic limitations. Much like in Rakhshan Bani-Etemad’s festival hit, Tales, Moaadi is easily the best thing about this film. One only wishes the film could match the nuance and energy of his performance.